This Mars Global Surveyor (MGS) Mars Orbiter Camera (MOC) red wide angle image shows a dust storm raging in the Valles Marineris troughs, Melas Chasma and Ius Chasma. Skies are clear over western Candor Chasma (upper right). MOC images have shown that Mars has many weather phenomena that repeat, like clockwork, from year to year. This picture was taken during southern winter at a time of year that commonly has dust storms that come up from the plains south of the Valles Marineris, then enter the southern chasms of Ius and Melas. 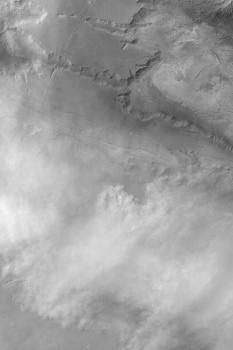 The picture is located at 8°S, 77°W, and covers an area 246 km (153 mi) wide. Sunlight illuminates the scene from the upper left.